These beautiful blue fused glass beads just seemed to speak for themselves when I first saw them. The dichroic sparkle and color shift is mesmerizing, and I really didn’t want to design anything that would detract from them. I finally settled on placing each bead into a simple seed bead bezel and accenting them with alternating dangles of crystals. 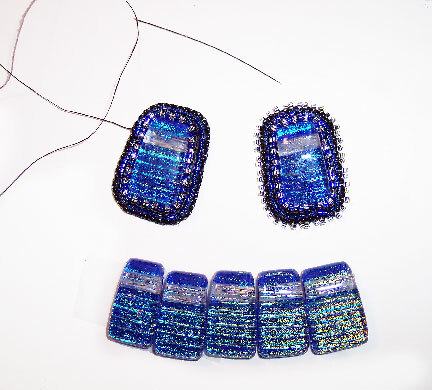 My friend Jeanne Kent made the beads, and I just love her style! If this is the first time you've tried bead embroidery, I suggest that you download a free copy of the first chapter of my e-book, Every Bead Has a Story. There are step-by-step photos, quite close up, of how to do the back stitch and edging brick stitch that are used here. Part one covers how to stitch up the bead embroidery pieces. Next week in part two, I'll share how to do the wirework that puts them all together! 1. Lightly glue each fused glass bead to the center of a 2x2" piece of ultra-suede using E6000 and let them dry. 3. 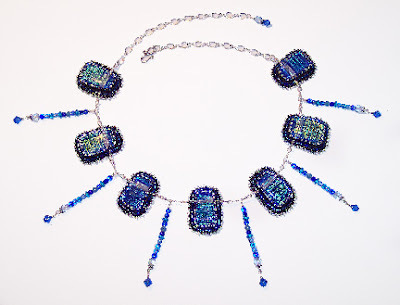 Add a third row of peyote in blue Delicas and a final row in silver so that the blue and silver beads alternate around the top of the focal piece. 4. Back down at the base of the focal bead, add a second back stitched row, working outward from the black foundation row, this time using blue Delicas. Run your thread through all the Delicas and pull gently to snug this row as well. 5. Clip the ultra-suede close to this row of beads, being careful not to cut into any threads. Using just enough fabric glue to create a slight tack, attach another small piece of ultra-suede to cover your stitching. The glue will only be holding them together while you do the final stitching. Don't use much or you'll stain the ultra-suede where it seeps through. Let it dry. Cut the bottom layer of ultra-suede even with the top piece. 6. Stitch on the edging row using edging brick stitch. This technique leaves the beads standing up with their holes facing outwards. 7. Add silver Delicas between each of the black Delicas of the edging row by weaving your needle in and out of the holes. Secure the thread in the work and clip off the end. That is so me amazing beading! Love the colors.